The Colors Of Indian Cooking: Where I Get Cheesy. 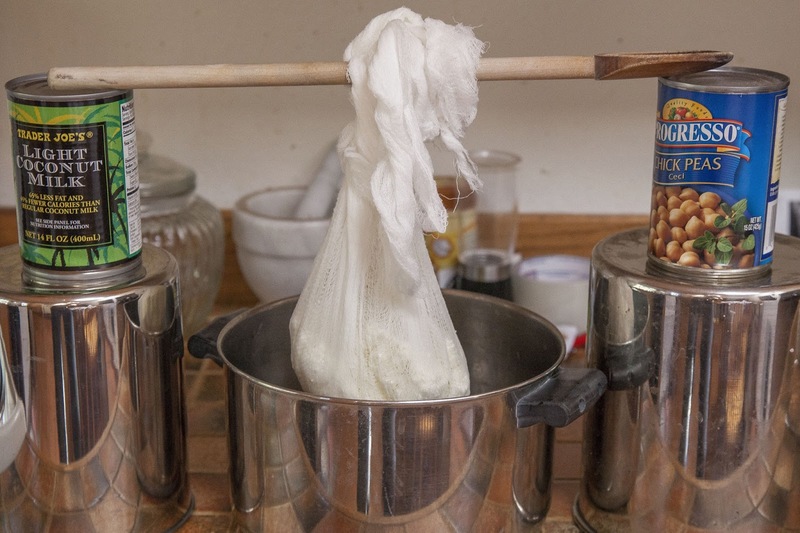 Make Your Own Paneer Cheese. 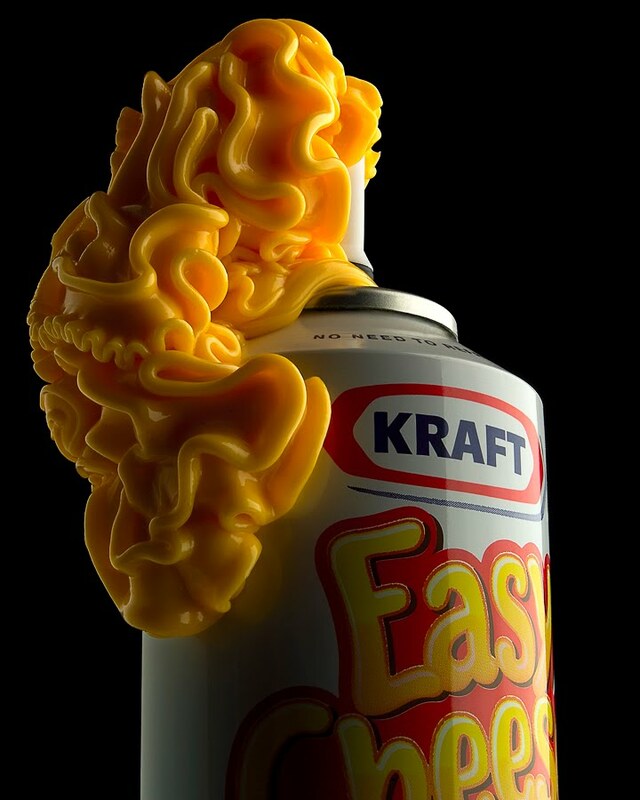 Where I Get Cheesy. 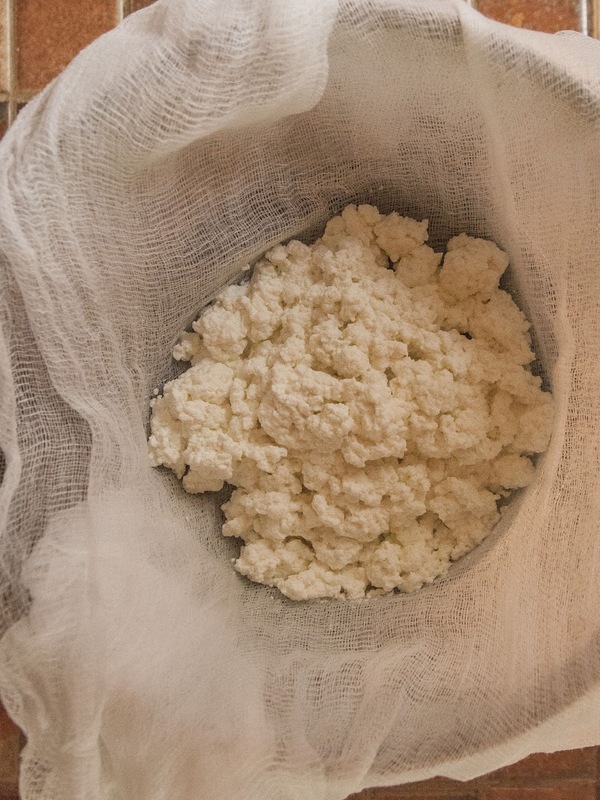 Make Your Own Paneer Cheese. I'm always up for some new experience in the kitchen. If it sounds interesting and I have the time, I'll try it. If I don't have the time I'll make the time. Sometimes I'll try something and then not try it again for quite a while. I either get distracted, busy with other stuff or I just forget about it. Cheese making is one of those things. I happen to be lucky enough to live in Curds and Whey Central here in Sonoma, California. Anywhere you can chuck a rock you'll hit an award winning cheese maker. This is a pretty interesting experience for someone who grew up wishing their parents would buy cheese in a can like everyone else. But no, my parents always had weird, stinky, old strange Italian cheeses. Fran may have loved Chef Boy-Ar-Dee but she'd top it, a can load of it, with the best aged Pecorino Romano she could get. Go figure. As a result I grew up a cheeselover. Older, Moldier, Stinkier, Runnier, Veinier, Rindier, and Bloomier. Those were my Seven Dwarfs and I was the Snow White of the Cheese World. 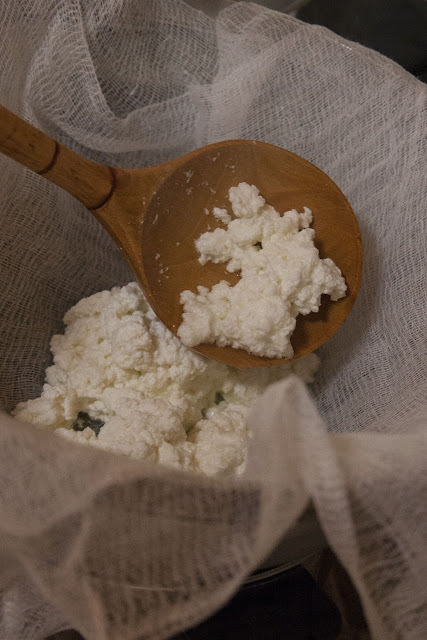 Making cheese however was something that had never occurred to me until a few years ago. 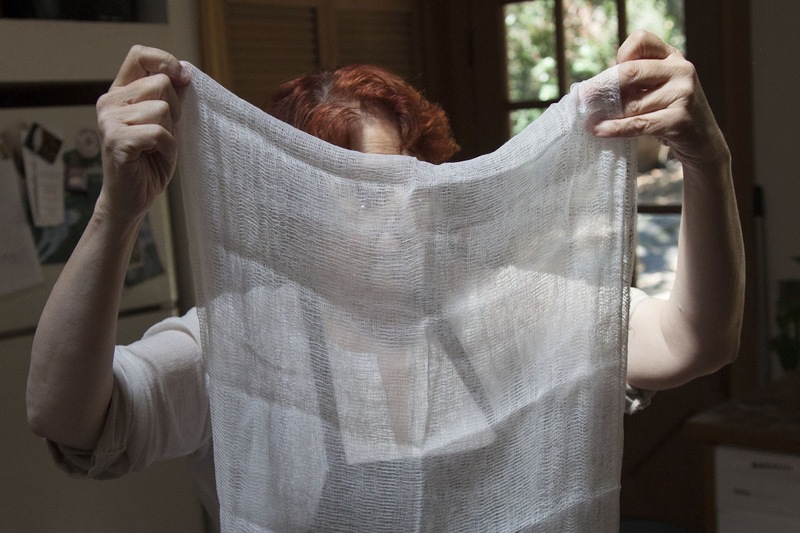 Paula Wolfert and I took a Cheesemaking Class with Sonoma Cheesemaker Sheana Davis. Of course I'd made paneer cheese and chenna cheese, but it had been a long time between curds. For some reason I got in a cheese making mood the other day. Maybe it was late Summer silly cheese season, and maybe it was the price of the store-bought paneer. Okay, yeah it was the price of the store bought paneer. As I've mentioned before I'm cheap, and I wasn't about to pay 8 bucks for a block of what looked like styrofoam and was passing as cheese. The hell with that I thought, I can buy my own local milk and make my own paneer, and so that's what I did. 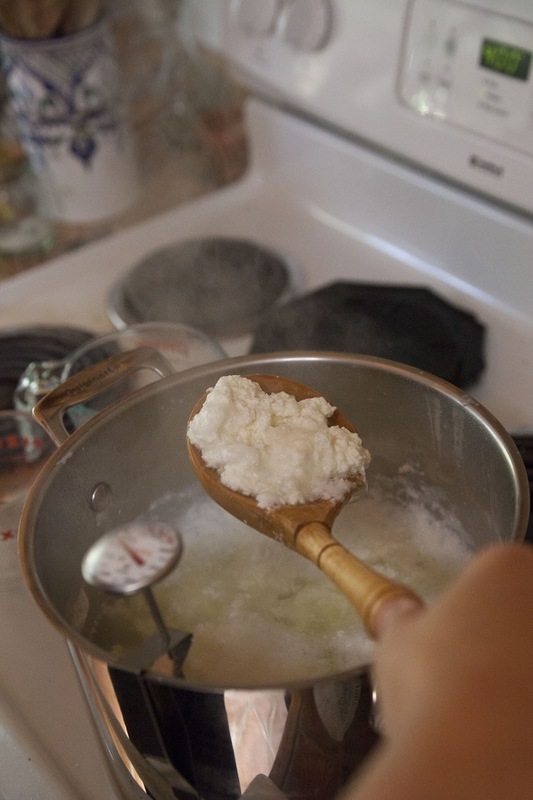 About 4 years ago when I first started The Colors Of Indian Cooking, back when I had a digital camera with a whopping 3 megapixles, back before Alan became my official photographer, I did a quick post on how to make paneer cheese. It was time to get serious and really show how it's done, because like a lot of things in life nothing is better (and cheaper) than fresh homemade paneer. Make sure the cheese cloth laps over the side. 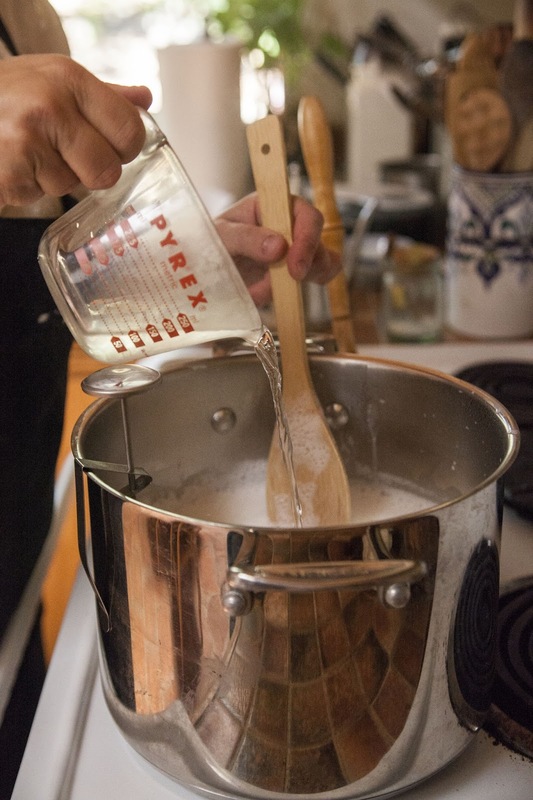 Pour the milk into a heavy non-reactive pot.. stainless steel, no aluminum! Bring it to a boil. 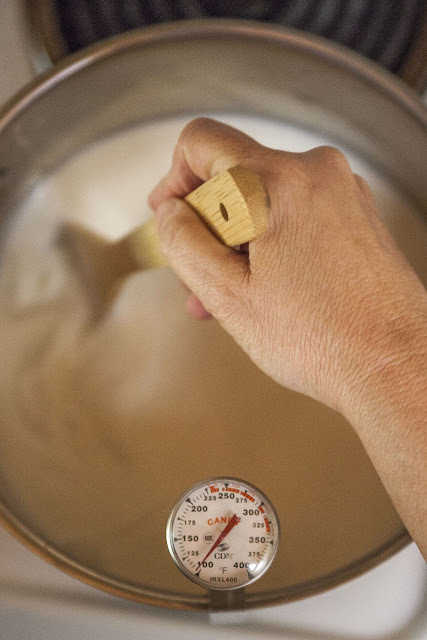 Use a wooden spoon to keep it from sticking to the bottom of the pan and scorching. Also I'd advise using a candy thermometer to make sure you 're always aware of how hot it's getting. Watch that sucker. You may think it's all good and you've got it under control then Wham! It boils over! Take it from me, it happens easily and cleaning up after is not pretty. 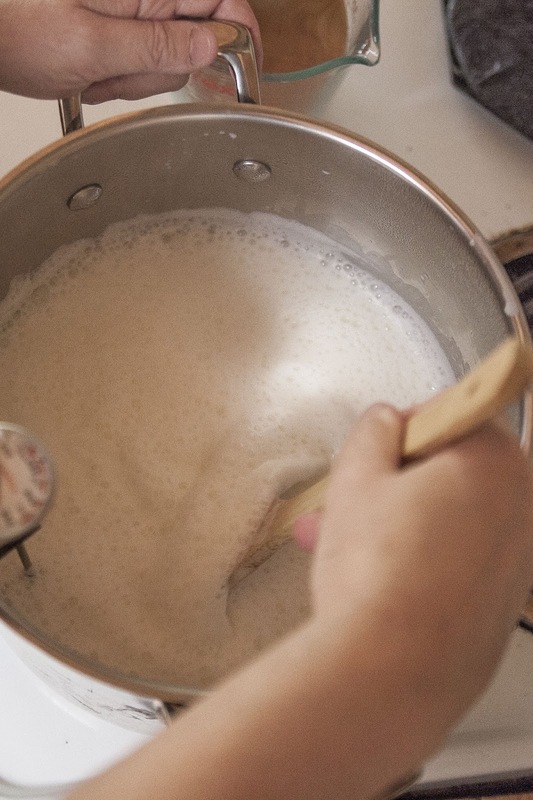 Just remember the boiling temperature of milk is 212 degrees F and if you're not in the U.S. it's about 100 degrees C .
When the milk is boiling, add the vinegar/lemon juice and turn the heat way down. Curds will form almost instantly. Stir it up. If the curds don't form, you can turn the heat up a bit and stir. 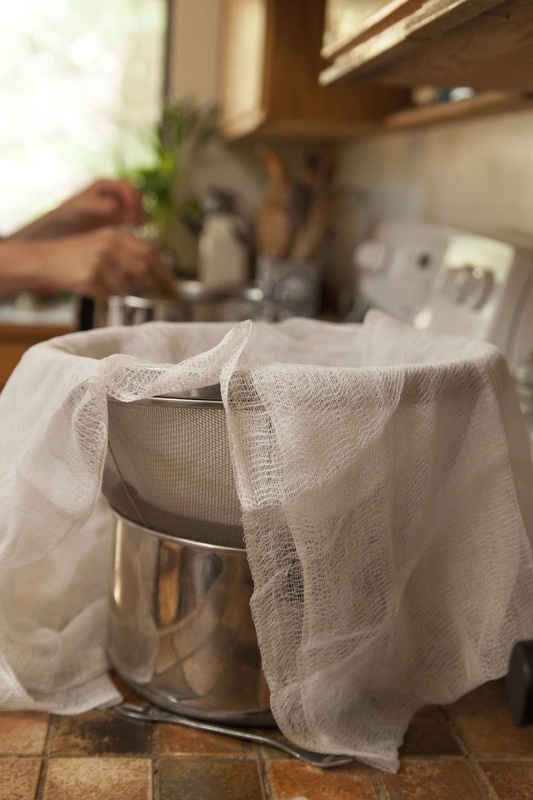 The curds will separate from the whey, which is the liquid yellow stuff. 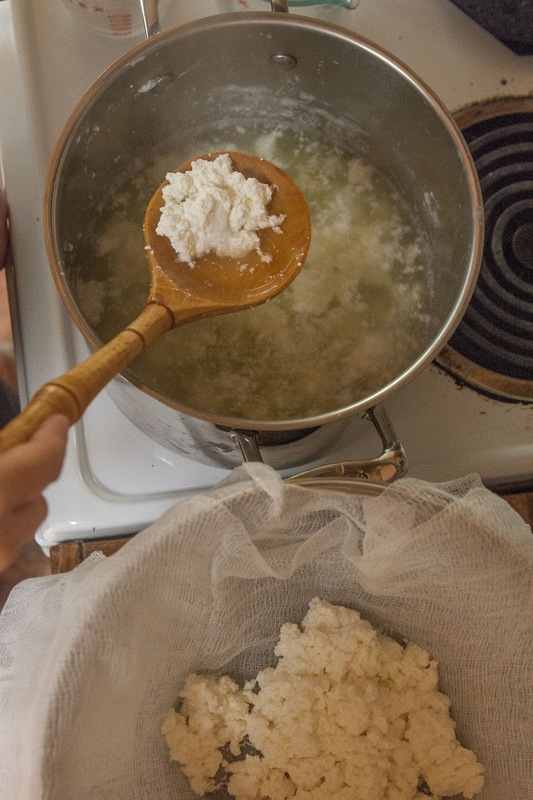 When the curds are separated, ladle it all into the cheese cloth lined colander. 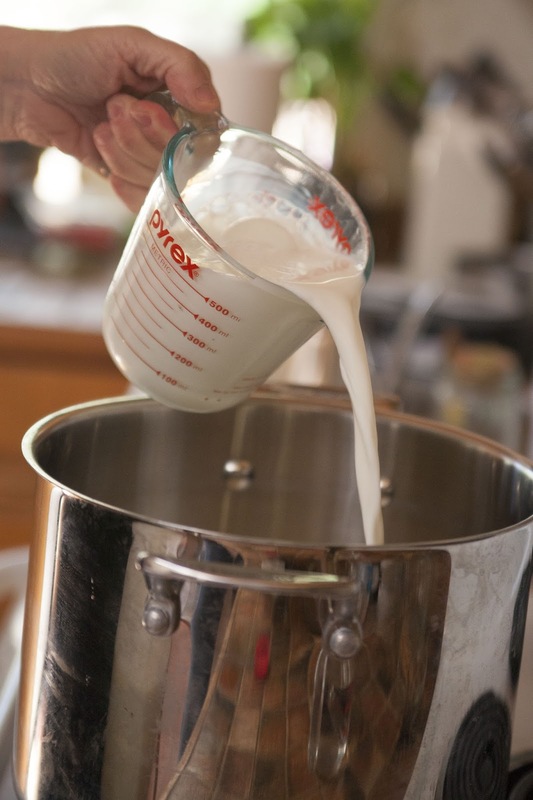 Ladle it gently so as not to break up the curds and get scalding whey all over yourself. Keep ladling until all the curds are in the cheesecloth. Note: There are uses for whey but we won't deal with that here, so unless you know some and want to save it for that, just pour it off. Let the curds cool a bit then draw up the sides of the cheese cloth into a little bag. Twist it tight to drain the whey and liquid off. 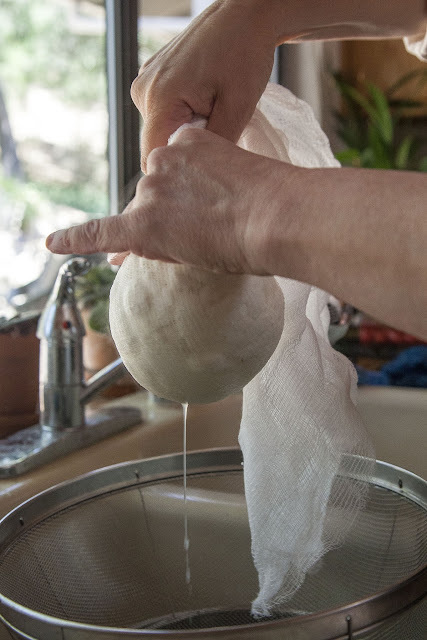 Hang the cheesecloth bag from the faucet and let it drain and drip into the sink or you can get creative like I did. 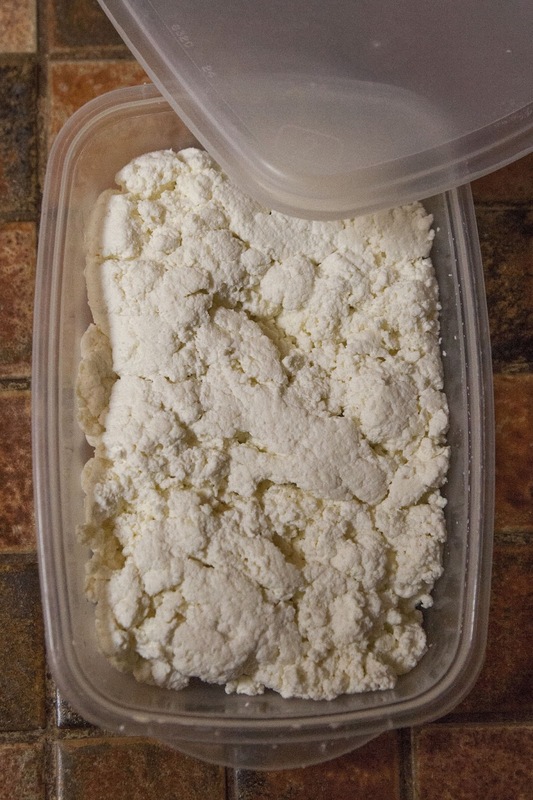 When it's cooled, you can press it into a pan, cover it and weight it down with some cans so that you'll have a flat block for cubing, or just scoop it into an airtight container it you want it to remain crumbly. Refrigerate either way. There it is, soft fresh, homemade paneer cheese for the price of a half gallon of milk. You can't get a better deal than that. Coming up next: What I did with my paneer cheese. 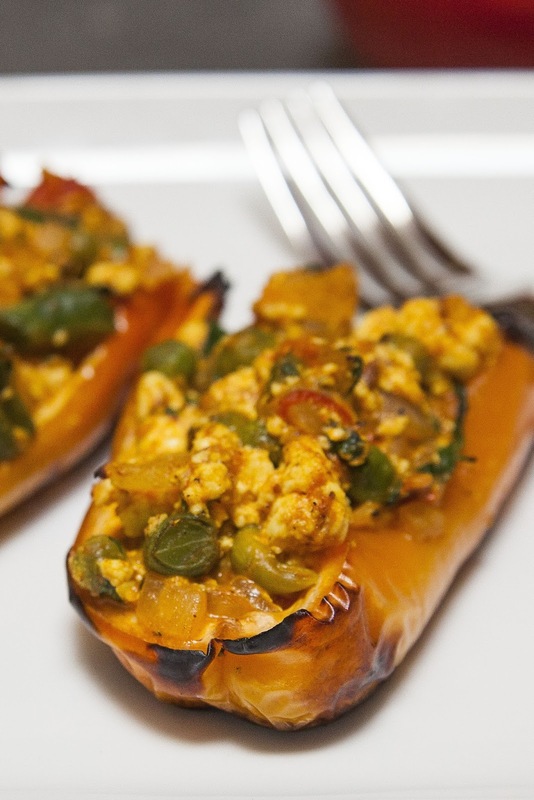 Rainbow Peppers from the Farmers Market stuffed with vegetables, spices and fresh paneer cheese for Meatless Monday. I didn't have much luck the last time I tried making paneer at home. so I'll have to try your method, Kathy. My husband like it cubed in his Indian creamed spinach. Me, I'm not so fond, but he just LOVES the stuff! Can't wait to give it a go.